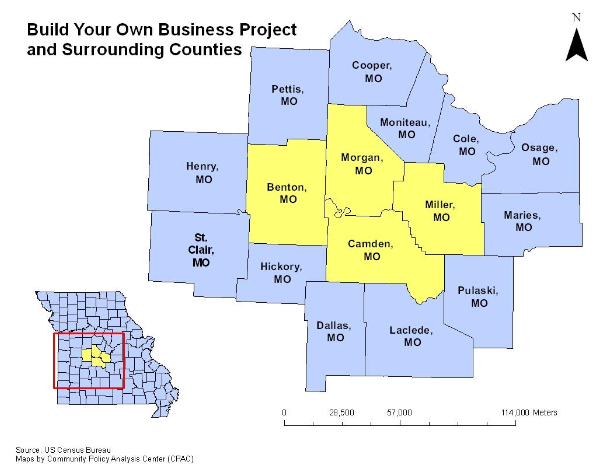 In 2007, the Build Your Own Business Project was accepted into the University of Missouri Extension Community Economic and Entrepreneurial Development Program (ExCEED). The project includes four counties: Benton, Camden, Miller and Morgan. ExCEED program leaders requested that the Community Policy Analysis Center (CPAC) provide basic economic information to the Build Your Own Business Project and three other regions accepted into the program at the same time. The ExCEED program assisted CPAC faculty to design the studies and underwrote the cost. Population - Total population in the Build Your Own Business Project Region was 103,747 in 2006. The region's population is projected to increase between 1.08% and 1.43% per year over the next ten years, bringing the total 2016 population to a range from 115,557 to 119,619.